This line of masculine grooming products has an old-fashioned, outdoorsy essence. Dynamic and down-to-earth. These words came to mind when Kyle LaFond remembered his grandfather, the smell of his aftershave mixing with the scent of chopped wood, crackling bonfires, and clean earth. 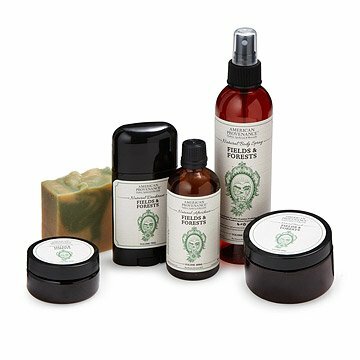 With this nostalgic recollection of one of the most inspirational men in his life in mind, he created this line of masculine grooming products with that clean, outdoor inspired essence. Vetiver, bergamot, and cedar notes reminiscent of fresh grass, evergreen, and a hint of citrus give each component in this grooming set a crisp, unprocessed, and subtle fragrance. Handcrafted in small batches in Blue Mounds, Wisconsin. Kyle LaFond’s strongest memory of his grandfather was the dairy farmer’s unlikely fresh scent. In fact, it led the former high school teacher to create what he calls “minimal-ingredient products to make people look, smell, and feel their very best.” He says he’s amazed by the enthusiasm for his products by customers, which include cancer survivors, wellness coaches, new mothers, and people just starting to read labels. “There's nothing better than someone telling me our products allowed them to feel safe and confident." Whenever he needs further inspiration, he simply walks outside. "There's something absolutely magical about the rolling hills and small streams of southwest Wisconsin," he says. "I love to watch the sun come up or marvel at the wind blowing through growing crops." The deodorant ruined my shirts. Don't buy this product. If you do, don't use the deodorant. It ruined five of my shirts. There must be some sort of oil in the product that stains. I didn't even notice until I walked into work like a fool, with gigantic underarm stains. We were under a lot of pressure to complete a project, so at first, when I noticed the stains during bathroom break, I thought I was sweating. Then, I realized that the stains were almost completely dry, but oily feeling. Still, it looked like I had just run 5 miles in my button down dress shirt. I came home and noticed the same awful stains to varying degrees of horror in all five of the shirts I wore after using this deodorant. I received this kit as a gift. Only used it for a week or two before noticing the damage it had done. What can I say? I smell great but I'd rather have my shirts back. I needed something different than a new shirt or tie, my husband enjoyed the new experience! My husband loves these products and uses them everyday! Great gift that he will enjoy! He was very surprised and hesitant at first, but he loves the products! The pomade doesn't stick in his hair very well, he also has a thick head of hair. Otherwise, he loves it! I gave this to a very special person in my life. I loved the scent but it doesn't stay. The scent is very short-lived. I bought these products for my significant other. The products are great. Great ingredients and work well. The only issue we found was that we did not enjoy the scent much. My husband has used all the items in the hygiene kit and him and I both love the fragrance! The beard oil and body spray are the best! My boyfriend, oddly enough, said a new year's resolution was to smell better. After I had an allergic reaction to his previous cologne and he threw it out immediately, I bought him this set as a replacement. His comments: "Yeah, smells like the woods. Adds to the whole plaid flannel lumberjack vibe you're into. I dig it. BEARD WAX?! POMADE?! NICE!" Needles to say we're both into it. Smells AMAZING, love that it's made just one state north of us. This is an original wonder and a great gift! Each product is sizeable and smells amazing. Use the products after showering: body spray, deoderant, use after shave (wife uses as perfume). Skin/beard balms also great on dry/chapped skin.